The Black Appearance group from Dodge is now offered on 2500 and 3500 models. Previously this was only available on 1500 models. 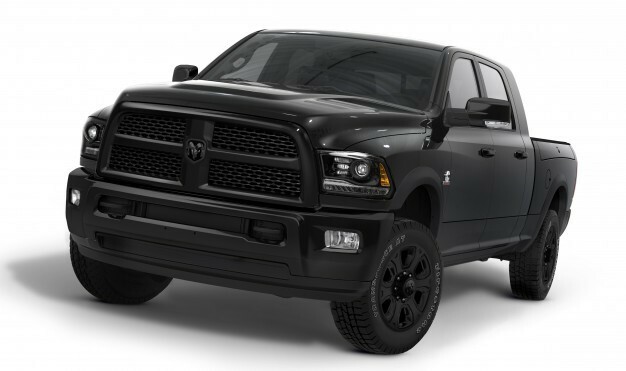 The new appearance features blacked out logos… except for a shiny chrome Cummins logo on the side. It comes stock with 20in black aluminum wheels, and front halogen projector headlamps accented with black bezels, and amber LEDs handling turn-signal and side-marker duties. A pair of integral front bumper-mounted fog lamps illuminate the way when the night turns dark. The LED tail lamps also get the dark treatment. Also included as part of the Black package is a backup camera and parking sensors. The 2014 Cummins combined with an Aisin transmission boasts 385 horsepower and 850lbs torque. Max towing is rated to 30,000lbs, which is close to the 2015 Ford F-350 at 31,200lbs. What will 2015 have in store for Ram trucks, only time will tell as it is due to come out later in the year!